We bought our first Vizsla in 1983 and cannot imagine life without them in our lives. As a breeder my vision is to do my best in making a positive contribution to the health and well being of Vizslas. We raised our family and breed these beautiful dogs. In 2006 we imported Scarlet from New Zealand. In 2007 we moved into our new home sitting on three acres which gave the dogs lots of space to run off some of their energy. We love living closer to nature and do not miss the busy city. Scarlet whelped two beautiful healthy litters of puppies and we kept a daughter from her last litter Ruby. She is now 6 years old and has had two litters of puppies herself. Ruby had 9 puppies in her first litter in November of 2013 of which there were seven boys and two girls. We decided it was a message that it was time again for us to keep a boy and spend more time on the exhibitor side of things and less breeding. The boy we kept is called Carson and he is growing into a handsome loving dog. He has his Championship in the show ring and has points towards his grand championship. He is a fun dog in obedience and he keeps the girls in our house in shape. He was a little slow to figure out the whole bird thing however he seems to be showing some real promise in the last six months. So we continue to training in the field to bring out his desire to hunt and point. We have many years of fun ahead of us with Carson. A side passion of mine is evaluating puppies using Pat Hasting’s “Puppy Puzzle”. I have evaluated close to 700 puppies from a variety of breeds and continue to evaluate puppies on a regular basis. With each and every litter there is something new I learn which keeps me humble in the dog world. Puppies at 8 weeks give us a snapshot into the future, helping to unravel some of the mystery of choosing the right puppy for the right home which help breeders to build strong breeding programs. 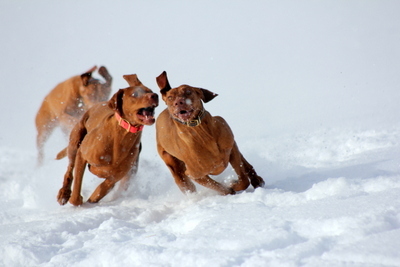 The best part about being owned by Vizslas is all the friends we have made around the world that we would not have known otherwise. Thank you to all those friends for their support and love over the years.